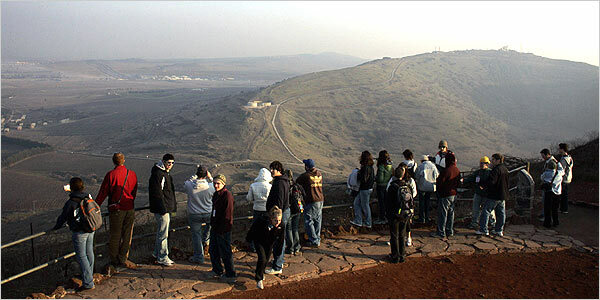 Where did the idea of turning the Golan into a nature park originate? Please kindly note that I have sent you a hard copies of the proposed subject matter including but not limited to a letter from Mr. Edward Dejrejian, president of the Baker Institute. A copy of a letter from former President Bill Clinton regarding the subject matter as well as a copy of a letter of acknowledgment from the office of Kofi Anan, former Secretary General of the United Nations acknowledging the same proposal. First there was the former Israeli official at the foreign ministry [Alon Liel] and his buddy the Syrian-American Businessman by the name of Ibrahim Soleiman. Now Fred Hof, a US Ambassador attached to George Mitchell is advocating a Nature Park be established on the Golan separating Syria and Israel. Here is my proposal of 2001-2002, which precedes these proposals. A Proposal regarding peace between Syria & Israel. Introduction: The following proposal can be suggested to both parties of the conflict, Syria & Israel, with a hope that it will ultimately lead to a permanent peace between the two parties. The idea is so simple, nifty and novel that both parties may find it acceptable and neutral in its concepts with a possible positive outcome for ALL. 1- The Disputed Area: Both sides, Syria & Israel, will relinquish sovereignty and claims of sovereignty of the area to a non-governmental international body or non-governmental international organization concerned with environmental issues and progressive environmental programs. 2- Area Transformation: The disputed area under the direction and supervision of the named environmental organization can transform the formerly “disputed” area into a Nature Reserve & Wild Life Sanctuary. Both countries can add a few miles here and there to enhance the size of the area to make it more attractive and establish a viable piece of land, ecologically speaking, that can not only serve both countries but the entire region at large. 3- Research and Education: A center for environmental research, wild life management, and land restorations can be established in the area. Scientists, engineers, technicians, laymen and even lawyers from both countries and the world at large can gather for seminars, lectures and symposiums and be able to discuss the environmental problems facing the region and other regions of the world with similar problems. 4- Some candidates: Possible candidates for administering this are The Nature Conservancy and the Wild Life Fund. No, I am not a member of either. 5- Security: The security of the area can be provided by a small contingent of a police force drawn up from various countries on a rotating basis and supervised by the United Nations. 6- The Public Perceptions: I do believe that the public sentiments in both countries, Syria & Israel, would be more receptive to the idea of establishing a nature reserve and wild life sanctuary on the border between the two states. The entire idea for which I am proposing can substitute the ideological and demagogical divide prevailing the cultures of the antagonists. No more piece of rock here and there, no more inches and centimeters of disputed soil marking some artificial lines drawn up in the 1920’s. Earlier, he had received accolades and awards from France, Britain, Russia, the Ottoman sultan, the papacy and President Abraham Lincoln, who sent him not a medal but, in quintessentially American fashion, a matched pair of fancy Colt pistols. The man being honored was Abd el-Kader, a learned and fervent Muslim, who for 15 years had organized and led a jihad against a Western power. After he ceased hostilities, his four-year detention, in violation of a promise of safe passage into exile, became an international cause célèbre. Released and feted, even by his captors, he came to live in Damascus. 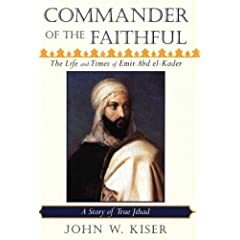 There, in July 1860, el-Kader braved mobs and saved thousands of Christians from a murderous rampage through the city’s Christian quarter. In this, the bicentennial of his birth, el-Kader’s name is known to only a tiny fraction of Americans. That fraction includes those knowledgeable about modern Algeria, where his resistance to French colonization places him among the founding figures of an independent nation. And then there are the 1,500 residents of Elkader, a town in northeastern Iowa, founded and named in 1846 by a frontier lawyer who admired the freedom-fighting exploits of this “daring Arab chieftain.”…. Jane Geniesse, Former NYT reporter….. an absorbing and beautifully written story of a great hero who is a model warrior for Muslims and non-Muslims alike. The reader is bound to be moved by the life of this remarkable man who was the very opposite of a fanatic jihadist…. I need not read any further. It’s sad to see this ugly idea rearing its head again. A Syrian who wants Syria to give up its claim on the Syrian Golan Heights. Why not hand over Damascus too? It drives me mad to hear a Syrian shy away from the word OCCUPIED. He doesn’t use the word once. Shame shame shame. This guy should go back to Algeria, The land is Syrian, we must never accept anything else, we must never give it up and we must never allow a “park” for those who occupy Palestine to enter Syrian soil. he is not syrian, he can go back to his grandfathers’ land and make a nature park of it. Kind of an oxymoron isn’t it? I mean, he is proposing a ‘solution’ for a political problem (although it’s much broader than that for Syrians) by relinquishing sovereignty and then he expects people to receive his ideas positively. I have no real knowledge of politics myself, so I propose turning the disputed area of Palestine into a sanctuary for endangered species. Security could be kept by a thin contingent from various Arab countries, and the pistachio could be supplied from Aleppo and the entertainment and shisha from Egypt. Didn’t you guys read this article in Alhayat about this subject couple weeks ago? the strange thing is that the link for this specific article in Alahayat is not working?! يفتح دخول الولايات المتحدة على المسار السوري – الإسرائيلي في هذه الفترة بالذات آفاقاً جديدة، من شأنها إذا نجحت، أن تكون خـطوة تــساهم في خلق شرق اوسـط جديد مختلف عن ذلك الذي رسمه شمعون بيـرس في كتابه الشهير، ويختلف حتى عن ذلك الذي كانت تبحث عنه الادارة الأميركية السابقة. ففي حين كانت ادارة الرئيس السابق، جورج بوش، عقبة امام المفاوضات السورية – الإسرائيلية، فإن الرئيس باراك اوباما اختار سورية لأن تكون نافذة السلام في المنطقة، ما قد يخلق واقعاً جديداً يلزم الاطراف المتنازعة الاقتراب من بعضها بعضاً، بعد عشرات السنين من العداء والحروب الدامية. وفي هذا السياق حصلت «الحياة» على مسودة لمبادرة أميركية تقترح تصوراً لحل مشكلة الجولان، وهي تحمل جديداً على رغم حملها ملامح حلول سابقة. وهذا الجديد يكمن في التفاصيل. الخطوات الاولى في خطة واشنطن لاقتراح التسوية السلمية بين إسرائيل وسورية ستكون في ترسيم الحدود النهائية من جانب الامم المتحدة وبرعاية أميركية فيما يتم انسحاب كامل لإسرائيل من الجولان، ووضعه كله تحت السيادة السورية، وجعله منطقة منزوعة السلاح، وتأجير بعض المناطق فيه الى إسرائيل لمدة 10 – 15 سنة، وتحويل ثلثه الى محمية طبيعية أو حديقة دولية سيطلق عليها اسم «حديقة السلام»، وسيتاح للإسرائيليين دخولها من دون تأشيرة مثلما هو الوضع في اتفاق السلام الإسرائيلي – المصري. وهذا اقتراح سبق ان تداوله طرفا المفاوضات الإسرائيلي والسوري في تركيا في فترة حكومة ايهود اولمرت. والفرق انه يأتي هذه المرة من واشنطن. وفي الخطة، فإن الادارة الأميركية برئاسة باراك اوباما تضع امامها تحدياً كبيراً في خلق واقع جديد تجاه سورية، تشجعها فيه على الابتعاد من ايران وحليفيها «حزب الله» و «حماس». وفي الخطة من غير الممكن ان توافق إسرائيل على سلام مع سورية في الوقت الذي ما زالت الاخيرة تدعم ايران و «حزب الله» و «حماس». وفي هذا الجانب يتفق الأميركيون مع إسرائيل على ضرورة التزام سورية تغيير طابع علاقاتها مع هذه الاطراف، باعتبار ان «السلام مع إسرائيل يتطلب عدم اقامة تحالفات عسكرية مع أعداء إسرائيل». ويظهر الأميركيون في خطتهم ان القضايا الرئيسة التي يتعين حلها من جانب إسرائيل وسورية تتعلق بالحدود والمياه والأمن وتطبيع العلاقات الثنائية. ويأخذون في اقتراحهم مخاوف الطرفين واحتمال مواجهة صعوبات للحصول على موافقتهما بالاشارة الى ان مسألة المياه قد تشكل عائقاً كبيراً في التوصل الى تفاهمات. ولمواجهة ذلك، تشمل الخطة مشاريع تضمن للطرفين مواصلة السيطرة على عدد من الموارد والمحميات الطبيعية في المنطقة والاستفادة منها. وفي مركز الاقتراح: سورية تحصل على الارض وتنظم عملية الوصول الى المياه، فيما إسرائيل تحصل على المياه وتنظم عملية الوصول الى الارض. ويتوقع معدو الخطة ان تكون مقبولة من سورية اكثر منها من إسرائيل حيث ستجد سورية نفسها صاحبة السيادة على المنطقة، خصوصاً «الحديقة الدولية». معدو الخطة يأخذون في الحسبان ان المياه التي كانت سبباً رئيساً في استمرار النزاع بين البلدين وسط اطماع إسرائيلية بمواصلة السيطرة عليها يشيرون في مقدم اقتراحهم الى ان إسرائيل تضع قيمة أعلى من سورية للموارد المائية بالاشارة الى شركة المياه الإسرائيلية (مكوروت) التي تستخدم من مياه طبريا حوالى 400 مليون متر مكعب سنوياً. وبالنسبة اليها، فإن بحيرة طبريا اصبحت اليوم بمثابة الخزان الرئيس الطبيعي، ومنه تتوافر المياه لإسرائيل في مراكز الكثافة السكانية وكذلك لبلدات الجنوب. وفي تفاصيل موضوع المياه، فإن إسرائيل تتلقى 850 مليون متر مكعب من مناطق تجمع المياه (350 مليون متر مكعب منها يتبخر). نهر الأردن يساهم كمعدل متوسط بنحو 520 مليون متر مكعب منها 250 مليون متر مكعب من نهر دان و 150 مليون متر مكعب من نهر الحاصباني. و120 مليون متر مكعب من بانياس. ونحو 50 مليون متر مكعب كمعدل سنوي يصل إلى البحر من الجداول القادمة من مرتفعات هضبة الجولان. كما يصل نحو 30 مليون متر مكعب إلى البحر نتيجة وجود 15 هضبة في الأراضي الإسرائيلية. وإزاء المعطيات، يرى مــعدو الخطة انه على رغم ان نهر الاردن ومصادره وبحيرة طبريا حيوية لإسرائيل في التوازن الهـيدورليجي، فإنها أقـــل مـــن ذلــك بكثير بالنسبة الى سورية، في حين ان احتياجات دمشق للمياه تتزايد بسرعة كبيرة في الوقت نفسه. وإزاء الاشكاليات المتوقعة بالنسبة الى قضية المياه تعمل خطة السلام على اعادة منطقة بانياس الى سورية فيما السيادة على بحيرة طبريا تبقى لإسرائيل في الوقت الذي يمنع على إسرائيل تفكيك المشاريع المائية التي أقامتها على مرتفعات الجولان خلال سنوات طويلة، وفي المقابل تعمل سورية على التخفيف من المخاطر البيئية على الموارد المائية وتمتنع عن اعادة توطين نهر الاردن وتنفيذ عمليات استخراج مياه من موارد المياه الرئيسة بين نهر الحاصباني وبانياس ونهر الأردن وبحيرة طبريا ونهر اليرموك، على ان تقتصر المشاريع على تقديم الخدمات وتوفير الاحتياجات المحلية. وفي الجانب العمراني ترى خطة السلام أن تكون القنيطرة العاصمة الادارية لمنطقة الجولان بحيث يتم بناؤها من جديد وإعادة توطين ما لا يقل عن خمسين الف مواطن فيها. وقد أعدت لهذه البلدة مشاريع صناعية تضمن توفير المياه والبنى التحتية. اما قرية الغجر فوفق الخطة ستعاد الى سورية على ان تواصل حصولها على المياه من الوزاني والحاصباني كما سيتم نقل الحمّة الى سورية وخلال ذلك يتم الانسحاب الإسرائيلي من مياه نهر اليرموك. وتستبعد الخطة اقتراحاً سورياً بإعادة توطين 400 الف سوري في الجولان لعدم امكانية توافر الخدمات لهم بخاصة لجهة الموارد الزراعية والمياه لأسباب تعود في الاساس الى التكاليف الباهظة لضخ المياه. وفي ما يتعلق بمصير المستوطنات القائمة على الاراضي التي ستعاد الى سورية، تتطرق الخطة في شكل خاص الى مستوطنة «كتسرين» كبرى مستوطنات الجولان والتي تشكل مركزاً حيوياً لهذه المنطقة. وستعود المستوطنة الى سورية من دون قيام إسرائيل بتفكيك اي مشروع فيها سواء مصنع المياه او مصنع النبيذ او الاماكن السياحية المهمة او حتى الابنية. ويخطط لأن تكون مركزاً مهماً وحيوياً في مشروع الحديقة الدولية الذي سيقام على مساحة ثلث الجولان. الامر الجوهري في الخطة التي اعدتها الولايات المتحدة يتعلق بحديقة السلام، باعتبارها الحل الذي يسهل مجابهة المعارضة الإسرائيلية للانسحاب من الجولان. الحديقة ستكون تحت السيطرة السورية وبإشراف دولي وستُبقي على علاقة إسرائيلية مع الجولان. وقد اختار اصحاب الفكرة اقامتها على منطقة تقام فيها حالياً عشرون محمية طبيعية انشأتها إسرائيل ويعتقد الأميركيون ان هناك حاجة لأن يصل خبراء إسرائيليون لمساعدة السلطات السورية في تطوير وصيانة المواقع السياحية المتوقع ان تحظى باهتمام خاص لدى الزوار اليهود. وفي اثناء تفعيل الحديقة تتخذ مختلف الاجراءات لضمان تحركات الطرفين من دون عوائق، بغض النظر عن وضع الحدود. ولضمان خدمات سريعة للسوريين والإسرائيليين، سيقام مركز طوارئ مشترك بالقرب من بحيرة طبريا تقدم فيه الخدمات جمعية الهلال الاحمر العربية السورية ونجمة داوود الحمراء الإسرائيلية. مع اقامة هذه الحديقة سيتم تنفيذ مخطط ضخم للشوارع ونقاط مراقبة الجوازات والجمارك، والترحيب بالزوار سيبدأ عند جسر اريك حيث تستبدل اللافتات الموجودة باللغة العبرية وترشد الى الطرق المؤدية الى المستوطنات المحيطة بالجسر بلافتة كبيرة يسجل عليها «مرحباً بكم في سورية». اضافة الى لافتات شبيهة ستظهر عند نقطة الحدود التي ستقام بالقرب من شواطئ طبريا وأبزرها «عين جيف» و «الكرسي». وضمن المخطط ستقيم سورية نقاط مراقبة لجوازات السفر عند منطقة جسر بنات يعقوب والطرق السريعة باتجاه بانياس. وفي تفاصيل الخطة الأميركية لمشروع الحديقة حلقات كثيرة ومن أجل حماية موارد المياه في حوض نهر الأردن، والأراضي السورية شرقي الحدود المتفق عليها في شكل متبادل ستسمى حديقة مفتوحة للجميع وستقام في مرتفعات الجولان بعد استكمال الانسحاب الإسرائيلي وتطبيق السيادة السورية وفقاً لمعاهدة السلام. الحديقة تمتد من الحدود المتفق عليها شرقاً إلى خط يتم تحديده بالاتفاق المتبادل. – ستكون حديقة مفتوحة للسياحة بإشراف سوري وخالية من المقيمين الدائمين باستثناء عمال الصيانة وموظفي تنفيذ القوانين. – لا حاجة الى تأشيرة لدخول الحديقة (من الأراضي الإسرائيلية) فيما سيصدر للسوريين تصريح الدخول لقاء رسم رمزي. – الزوار الراغبون في دخول الأراضي السورية الأخرى شرقي الحديقة يجب أن تكون تأشيراتهم صالحة للدخول والعبور تحت الرقابة السورية. والدخول إلى الحديقة يسري لمدة يوم واحد خلال ساعات النهار. كما ستقام نقاط تفتيش إسرائيلية. – الرسوم التي تتم جبايتها يمكن أن تساهم في صيانة الحديقة وربما لدفع رواتب العاملين في الجانب السوري. – عند خط حدود المراقبة توجد لافتات مكتوب عليها «مرحــباً بــكم في ســـورية ووادي الأردن ومحمية مرتفعات الجولان البيئية» كمسألة عملية. ولكن، كلا الجانبين لديه الحق في ضمان الحفاظ على الزوار بين سورية وإسرائيل بحيث يمنع تهريب الأسلحة أو السلع والسيارات غير المرخصة عبر 063017b.jpg الحدود. ويمنع منعاً باتاً تعطيل خدمات الزوار، وربما قد يتطلب الأمر من الطرفين قوات شرطة لإجراء الفحوص اللازمة قبل أن يسمح للزوار بالمرور للحفاظ عليها. في ما يتعلق بالأسلحة، يشدد الاتفاق على أن الحديقة ستكون ضمن المنطقة المجردة من الأسلحة، إلا للمراقبين الدوليين الذين يسمح لهم بحمل السلاح للحماية لفترة زمنية محددة بحسب المعاهدة. وغيرها من أسلحة ستقتصر على الجانب السوري الذي سيقوم بالحفاظ على أمن الأفراد. باختصار، فإن هذه المعاهدة بين الطرفين السوري والإسرائيلي برعاية أميركية تضمن الحفاظ على وصول الزوار إلى الحديقة في شكل آمن وذلك بوجود نقاط تفتيش تابعة للشرطة تحول دون التهريب. اما زوار الحديقة فلهم الحق في التنقل داخل الأراضي السورية بواسطة الأوراق الثبوتية، مع العلم أنه لن تكون هناك تسهيلات جمركية عند الحدود لجواز السفر السوري! This guy should go back to Algeria, The land is Syrian….these are not my words but it is the general theme that i come across in again again on this blog… do you not see the racism in your society,look at your people’s words….and your dictator uses this hate of yours to keep his throne,oh yeah and i don’t believe you make peace with people that are not straight- foward and frank!Thank G. Israel is not like you say it is or you think it is but your society does not seem ready to accept people that are different,and those of you that are can not say it publicly ,what a shame. ‘The land is Syrian, we must never accept anything else, we must never give it up and we must never allow a “park” for those who occupy Palestine to enter Syrian soil. Isn’t this the butifull piece of hatred you guys learn in school?? ?you guys want to destroy not to build that’s how you loose territory…..your system has made you like robots…did you guys ever learn to think for yourselves at all or to question your own actions or your own propaganda…what a shame!Why don’t you say what you were taught loud and clear so that you understand who has hate and who refuses peace ‘occupys palestine’ you guys actually believe in your own lies like hitler!by the way the occupy palestine thing was imported by goering to the mufti in 1943 before that even though arabs hated their jewish neighboors they weren’t lying to themselves about the jewish presence like you guys. AVI,8. I am born in Western Europe, have lived all my life in Western Europe, and is educated in Western Europe. Hatred? Destroy? no no.. Liberate what belongs to us. AVI, your comment diarrhea is constant, why don’t you take a whole pack of Imodium immediately. How many worthless comments we need to read for you in a day? What part of 3 comments a day you don’t understand? As I told you before but it seems that your understanding is minimum, if you can’t count I’ll help you and your 4th comment will end up in the bin so don’t even think of trying. UNDERSTOOD? …… human rights then the only word left with all due respect is to call this idea ‘occupy Palestine’ a racist idea ,historically false ,meant to deligitimize israel! again this is the root of the conflict like it or not!And this is wrong!and Jad this is the reality we Israelis live with!So let me tell my side of the story please. For God sake when will this clown be banned? We need to de-clutter the comment section. His comments are a turn-off for anyone who would want to engage in an intelligent discussion. On a different note, I want to applaud King Assad for raising the minimum punishment to TWO YEARS for men who kill their sisters or daughters to defend the family’s reputation or “honor.” The recent change in Syrian law was noted in a full article in the Economist magazine: http://www.economist.com/world/africa/displaystory.cfm?story_id=14045284 . According to the Economist, killing your sister if she sullied your family’s honor previously resulted in a maximum sentence of one year in Syria. Now the minimum sentence is two years. The Economist characterized this as “a small but significant change.” Apparently, the dictator is quite modern, quite the reformer. Bravo Bashar, you are on the road to progress. Khutwa bi khutwa. I have a farm. In my farm, a baby horse (colt) was born. I gave him his name. Some time after that, my colt got stolen. Years later, I see my stolen horse in the hands of the thief. for not mentioning this before). Now lets study the Etymology of the Term (or word) “Golan”. Muslim roots? … Of course not. This is a word in Hebrew. keep calling MY stolen land with the name I gave it. You are a rude trouble maker, a propagandist who makes the occasional good arguments. You are joining Avi and Majid in moderation. Which means your comments will only appear when they are politely formed and relevant to the discussion … if you want to keep linking old news about honor killing in Syria then your comment will not be released, if most of the energy in your comment is about the baathist regime, King Assad, and Syria’s terrible education, then don’t bother writing it. You are welcome to discuss solutions and to explain Israeli point of views though. Your propaganda is not welcome, and if you vote more than once (like the 8 times in the last poll) you will never be unbanned again. Amir in Tel Aviv, your allegory is useless and belongs in the garbage can. You are trying to portray it that it belongs to you, to today’s “Jews”, that Golan belonged to you, or maybe even ancient Jews. Since when did Ethiopians(Beta) have anything to do with the ancient Jews? or Ashkenazis(Khazars)? or Sepharidi(Spaniards/Berbers)? I do not understand the relevance of the biblical verses you posted. south (of today’s) Jordan, to the mount Hermon (one more Hebrew word). About your “ancient Syrians”: they were Romans. Not “Syrians”. ‘Siria’, just like ‘Palestina’, is a foreign term to this region. Those terms are Roman. No linkage to Arabic or Islam. or even ‘Arabism”. why you insist on keeping and calling sights here, in Hebrew names..? What is the meaning and the source of the term “Golan” .. ?? I don’t care what the origin of the name Golan (or more accurately, Jolan) is. It’s a Syrian land that was inhabited by Syrian people before Israel occupied it. So it’s going to return to its rightful owners sooner or later, despite you. So what if the word was Hebrew in origin? (i’m not even sure it is but let’s just suppose). What does that mean? You’ve just claimed that Syria is also a Roman name, does that mean Italy is entitled to come and annex Syria as well? And by the way, a simple research would have shown [deleted by admin] like you that Syria is the name the Greek used to call the area where the Assyrian people lived. The Assyrian people who are an integral part of the current Syrian population. The same research would have shown a [deleted by admin] propagandist like you that Syria, as it’s been geographically recognized by the Greek, had preceded the later Roman devisions like Judaea and Palaestina, and that it had encompass the entire Levant. I guess that should make us entitled to the entire Levant. Why not, it’s not a bad idea. The Burj is almost complete. Total height of 818 Meters. It’s due to open later this year. I like the [deleted by admin] alternative. It’d give the paranoid mind a field day figuring out what it could have been. Listen Zionist troll: you’re such a [deleted by admin] who gets off by [deleted by admin] at his [deleted by admin] ..etc.. Offended .. it sounds like fun! .. and less work for me. But then again, I’m sure Amir will have his own way of optimizing this communication tool that you like. I was just there last week..it does look like a park for tourists to come along guided tours. Once there and for five shekels you can get the whole history of the heights through binoculars from the Israeli perspective of course..
Daadaoui, a Moroccan professor, just spent the last few weeks in Israel on a Government financed junket, where he met intellectuals, politicians, etc. of many different stripes. Perhaps he would write a summery of his tour and impressions he has taken away about the possibility for peace.? It came to my attention that the dispute revolves around a few hundred square meters bordering … Lake Tiberius… By resolving this issue may usher a new path that may lead to peace between the two nations. The disputed territory which Jazairi talks about is not the whole of the Golan, just a sliver of land around the border between Mandatory Palestine and Syria. I’m sure even the most ardent ideologues can understand the challenges that are inherent in interpreting and agreeing upon the meaning of old colonial maps, and on the dispute between the English-French borderline and that which was subsequently established as part of the 49 armistice agreement. As far as the idea itself is concerned… It’s a *great* idea to turn this disputed territory into a nature reserve and furthermore the countries should agree to add additional land to the reserve as Jazairi suggests. As we humans fight over and obliterate the land the fragile habitat around the Kineret/Lake Tiberius and in the Khula valley (another disputed area) is collapsing. It would be a great idea to liberate the land from the subjugation of political and military abuse in the service of the conflict. This area is one of the most important stations for migratory birds in their journey from Europe to Africa and back again, every year. We should remember that however precious our scriptures and ideologies are to us, we are not the sole inhabitants of this land, and really give it some respect, rather than just claim ownership and abuse it in the service of these claims. The Golan and the Khula will be there 10,000 years from now. Israel and Syria will not. Let’s just put this into perspective. However, Jazairi is in error. I don’t think that the most intractable problem was ever around land sovereignty per-se. The two big issues from Israel’s perspective were (a) Syrian reorientation and (b) water rights. Water rights were always more important than actual land. The land ownership is crucial only in terms of conferring water rights. If the water issues could be agreed upon, then agreement over the land will not be a big obstacle. The area mentioned above is indeed few hundred square meters. Many readers did not notice the size. Blame on on the lasting effect of first impressions. The peace park idea started being promoted when Haaretz published the paper prepared by Mr. Alon Liel and a Syrian American businessman. At the time we read different estimates of the percentage of the Golan that was supposed to be a neutral “peace park” … the proposed area ranged from 30% to 70% of the Golan Heights. As a result, I would say every Syrian I spoke to totally rejected the idea. By now it is not easy to undo the damage to the “peace Park” label. The biggest problem on the Syrian and Arab sides is that … it will be hard to find anyone who trusts Israel and its intentions. When every single Israeli coalition government consistently managed to protect and promote the process of building more settlements, then there is no need to think twice about intentions. the argument that the settlers are too strong to be opposed does not convince many in the Arab world. When Mr. Begin signs a peace treaty with the strongest Arab country (Egypt) only to annex the occupied territories of the second strongest (Syria) in 1981 then his intentions are quite clear no matter what sweet speeches were given outside the White House at the signing ceremonies with President Sadat. When the “moderate” peace seeking Ehud Barak goes on yet another bloody war that kills over a thousand Arabs, then peace makers in Israel are not going to be seen as peace makers. When Prime Minister Ehud Olmert says “Syria has nothing to worry about from our army exercise, we will not attack Syria” then within a month Israel attacks, then any Israeli statement is considered worthless no matter how moderate is sounds. Israeli leaders totally messed up. To clean their image (and sadly it is the image that many Arabs attribute to “Jews” in general) they need to practice a year or two of honesty for a change. It is similar to how Israelis make the valid claim that many of the fundamentalist Arabs say one moderate thing in English and say its opposite in Arabic. But Syria stuck to one message for decades … never flipped. Yet those who do not want to return the Golan to Syria manage to ignore that fact and to focus instead on Syria’s ties to Iran for example as if those ties have anything to do with Syria’s abidance by UN resolutions 242 and 338 as the basis for a resolution to the conflict with Israel. Before proposals are put on the table, we need more straight talking from Israel… if anyone s to take Israeli peace-making intentions seriously. But with the current governing coalition in Israel … each day a different Netanyahu aid making wild statement about the way he sees the conflict being resolved, it is not going too well… Israel is indeed looking like the enemy no one should trust. I’m also familiar with the peace park ideas that are supposed to encompass a larger part of the Golan, and I fail to understand why they attracted so much opposition, since they did not involve any concessions in terms of Syrian sovereignity over the land. The idea was just to make it possible for Israelis to be able to cross over for day trips easily, and potentially also to own businesses or work on the heights. You live in Canada and I live in the US and we both know how these types of nexus arrangements foster good relationships and trust between countries, without any hint of diminishing sovereignty. I guess that those who have objected, did that because of the simple reason which is they are not ready for “warm” peace yet. If peace agreement with Syria comes before peace with the Palestinians, then there’ll be less appetite on the Syrian side for arrangements such as the peace-park which imply a warm peace with Israel. This means that such a peace deal for Israel will be *harder* to achieve internally. If a peace agreement with Syria follows the Palestinians or is part of comprehensive peace, then the opposite applies. This means that a cold-peace agreement for Israel with Syria will be both more painful and less rewarding than one that could be negotiated in the framework of comprehensive peace. (Now Shai will tell me I got this all wrong…). You are absolutely right that at this point, many Syrians are not comfortable with the idea of warm peace with Israel … images of Gaza are not easy to forget. But again … there is also the issue of never trusting any new idea (like the peace park) coming from from Israel. No one trusts Israel wants anything good for Syria… it is not only because Israel is “our enemy” .. but as I said earlier .. Israel consistently (very often, not always of course) said one thing and did its opposite. A regional peace conference is the best starting point. I have replied before you have expanded your comment. I agree with your concerns. Distrust is not misplaced with Israel. I guess for now we will have Israelis not trusting Syria because of its short term tactics (alliance with Iran, HA and Hamas) and Syrians not trusting Israel for its long term strategy (or at least the way it is perceived based on Israel’s actions). Comprehensive peace and a massive economic and media campaign are the only way to have a warm peace. حركة عدم الانحياز !!! أم حركة انعدام الوزن وانعدام الفعل ؟؟؟!!! يوم أعلن الرؤساء عبد الناصر وتيتو ونهرو عن تأسيس (( حركة دول عدم الانحياز)) في النصف الأول من خمسينيات القرن المنصرم. رفضنا نحن السوريين القوميين الاجتماعيين مفهوم عدم الانحياز، وقلنا إن لنا قضية مركزية تعني كلّ وجودنا، هي احتلال أرض فلسطين وتشريد شعبنا منها ليقطنها يهود العالم. هي لنا مسألة حقوقية وقومية بامتياز. وإن من يقف معنا ونقف معه يجب أن يكون منحازًا لقضيتنا الفلسطينية. قال لنا الداعون إلى تأسيس تلك الحركة أنها تعني عدم الانحياز لأي من المعسكرين الشرقي أو الغربي، (( حلف وارسو أو الحلف الأطلسي )). ـ قلنا حسنًا. لننتظر نتائج أعمال المؤتمر الأول لـ (( حركة دول عدم الانحياز)) ومقرراته، ليكون حكمنا صحيحًا على هذه الحركة من خلال مقرراتها وأفعالها. 1 ـ تقف موقف العطف من (( اللاجئين العرب )). 2 ـ تستنكر روح الاستعمار والعنصرية التي يظهرها اليهود في فلسطين. 3 ـ تأييد قرار تقسيم فلسطين الصادر عن هيئة الأمم المتحدة عام 1947. 1 ـ العطف على (( اللاجئين العرب )) لا يشرفنا. لأنه يظهرنا بمثابة المتسولين، ويجعل من المسألة الفلسطينية قضية عواطف وسياسات، لا مسألة حقوقية قومية. نحن نريد أن يساندنا أصدقاؤنا لاستعادة شعبنا حقه في فلسطين، كامل فلسطين..
2 ـ أما أن يستنكر المجتمعون روح الاستعمار والعنصرية التي يظهرها اليهود في فلسطين فهو تبسيط لما يحدث، لأن ما يقوم به اليهود في فلسطين هو عملية استيطان وجريمة إبادة شعبنا الفلسطيني لتوطين يهود العالم محله. 3 ـ أما قرار تقسيم فلسطين فهو أشد القرارات التي اتخذتها هيئة أو حكومة، أو شخص في التاريخ قسوةً وظلمًا وإجرامًا. وإذا كان أصدقاؤنا المؤتمرون في باندونغ سيقرّرون المطالبة بقرار التقسيم وتنفيذه، بدلاً من المطالبة بتحرير فلسطين لتبقى لأهلها، فسيكونون بذلك قد ساعدوا في تسديد الطعنة لنا، لأن القبول بقرار التقسيم الذي ينادي به نفر من ساستنا يدفعهم وهْمُهم إلى الظنّ بأن اليهود لن يقبلوا به. فهو ظنّ الجاهل لخبث ومخططات اليهود. فالصحيح هو أن اليهود هم الذين يدفعون في شعبنا وفي أفكار العالم فكرة تقسيم فلسطين، لينالوا عضوية دولة كاملة في الأمم المتحدة، حتى ولو كانت على نصف مساحة فلسطين، ليتوسعوا بعدها من أعالي الفرات إلى النيل، ويحكموا العالم منها كما وعدهم (( يهوه )). نصيحتنا للقادة والسياسيين الذين شاركوا في المؤتمر الخامس عشر لحركة عدم الانحياز، أن يأخذوا وثيقة (( إعلان شرم الشيخ )) ويلصقوها على لوح من الألواح الإسمنتية ((لجدار الفصل العنصري)) الذي أقامه العدوّ اليهودي في فلسطين. ليروا إن كانت كل مقرّراتهم في شرم الشيخ تستطيع أن تزيل لوحًا إسمنتيًا واحدًا من هذا الجدار، وليعرفوا وزنهم وقوة فعلهم، فيتأكدوا من أنهم في حالة انعدام الوزن وانعدام الفعل، وأنهم يساندون عدوّنا بإداناتهم ودعواتهم وتأكيداتهم على تقسيم فلسطين، بين (( قدس شرقية )) يقابلها (( قدس غربية ))، واعترافهم بـ )) إسرائيل دولة )) ولها سلطة الاحتلال. إننا لم نلحظ في كل مقرّراتهم ما يصل إلى مرحلة الفعل لمساندتنا في استعادة كامل حقنا في فلسطين. نحن السوريين الذين ما تخلينا يومًا عن واجبنا بمساندة ودعم الشعوب لاستعادة حقوقها. وكان الأخطر هو أن (( إعلان شرم الشيخ )) يؤكّد على المسؤولية الدائمة للأمم المتحدة على القضية الفلسطينية، فينكرون على شعبنا حقه في استعادة حقوقه وتقرير مصيره، ويجرّدونه من إرادته في الحياة، ويتركون لمجلس الأمن أن يقرّر عن شعبنا. عظيمة هي الشعوب في وجودها وفي نظر أعدائها، ومستضعفة أمام قادتها الذين يأخذون شعوبهم إلى حالة انعدام الوزن والفعل. وإلاّ ماذا يعني القول (( بحركة عدم الانحياز )) بعد أن انفرط عقد الاتحاد السوفياتي ومنظمة الدول الاشتراكية وحلف وارسو وانضم العديد من هذه الدول إلى الاتحاد الأوربي، وحلف الأطلسي، وباتت أمريكا قطبًا أوحدًا في العالم. وماذا يعني البقاء في (( حركة عدم الانحياز)) لدول تتواجد فيها قواعد عسكرية أمريكية، وتعلن صداقتها وتحالفها وتعاونها الاقتصادي مع القطب الأمريكي الأوحد. وماذا يعني (( حركة عدم الانحياز )) لمنظمة تضمّ أكثر من نصف عدد الدول المنضمّة إلى هيئة الأمم المتحدة دون أن يكون لهذا النصف أي فعل أو وزن… فالرئيس الكوبي رؤول كاسترو حين يدعو إلى نظام عالمي جديد يجاريه في هذه الدعوة الرئيس المصري وغيره من المؤتمرين. والرئيس القذافي حين يعلن تأذي الشعوب من مجلس الأمن الحالي، ويدعو إلى تشكيل مجلس أمن خاص بـ (( حركة دول عدم الانحياز))، أما كان أمام هؤلاء الرؤساء المقترحين، مَنفذًا أو مخرجًا ينقذهم من هذا النظام العالمي القائم على القطب الواحد الآن، ويخلصهم من قرارات مجلس الأمن المجحفة بحق الشعوب التي يقودونها… فيعلنوا انسحابهم من هيئة الأمم المتحدة المسيطر عليها من أمريكا، ومن ورائها اليهودية العالمية التي تقود النظام العالمي وتسيطر على مجلس الأمن. فينهار آليًا النظام العالمي القائم الآن، لينشأ محله نظام عالمي جديد.. أكثر عدلاً وأقل سيطرة لدول التماسيح، يلغى فيه حق الفيتو للدول الدائمة العضوية في مجلس الأمن، أو أن يعلنوا عن تشكيل حلف أو تكتل اقتصادي عسكري، في مواجهة حلف الأطلسي، فيكون الفعل الحقيقي لحركة تضمّ أكثر من نصف دول العالم. ويكون النصر لهذه الدول وشعوبها وقادتها. فكفى استبدادًا واستغلالاً للشعوب والدول من دول التماسيح لدول الأسماك. Well, we’re Syrians. So, by definition, we know how to circumvent official censorship. the [deleted by admin] is wrong with you, man? on a more serious issue, I’m thinking of starting an ‘environmental watch’ site for Syria, its obvious for me now that our Syrian environment is butchered days and nights with few shy reports written in the most polite language so it doesn’t offend anybody of this careless government of Outri and without any action done by them. Everyday in the local media on the web and the printed ‘government’ newspaper there are reports of crimes committed to our Syrian environment but no organization even the ones call themselves ‘environmental’ raise their voices or mentioning the alarming and even dangerous level of pollution, incurable nature destruction and natural resources waste level we reached. everyday I’ll try to collect the environment and development related article published by the Syrian media just to show how shamefully are those environmental organization (public and private) are, they must face the challenge and become affective than being bunch of empty ghost bodies as they are. First, for the record, the Peace Park idea (on 1/3 of the Golan) was a Syrian idea! To make sure it was still an option, a while ago Alon Liel checked through his European contacts, who checked with Syria. The response was: “Of course. It was our idea!” So I think it is still worth considering, because as Yossi said we’re not talking about sovereignty. In fact, such a “peace park” could only exist under Syrian sovereignty. By the way, Hof uses this idea to create a period of confidence-building, where both sides are able to interact, and see how different they are, from the images that have been attributed to them over the decades. It in no way, shape, or form, leaves Israel owner of the Golan. Second, Alex, if you want honesty from Israeli politicians (or from any politicians for that matter), you need to redefine the profession of a politician. In Israel, they are more corrupt and more “flexible” than in many other nations around this planet, but I promise you by far not that much different than most nations. Trust is important, but not between governments as between people. And although in Syria’s case, we Israelis will have to trust that Assad represents the will of the majority of Syrians (it makes sense), in your case, you will see precisely how the majority of Israelis think, when (fortunately and unfortunately) they’ll vote on a Golan-referendum. If most vote “Yes” to withdrawing, you’ll know that most Israelis want peace. You won’t need to see 1-2 years of “honesty” by Israeli leaders first. You must understand that Israeli governments are as unstable and as fragile as Israeli society is (they are a projection of one another). To survive, Israeli PM’s have demonstrated time and again their readiness to go far. Begin bombed Osirak. Barak left Lebanon. Sharon visited Al-Aqsa, and five years later left Gaza. Olmert attacked Lebanon, and also Gaza. Most of the time, these actions proved disastrous. And of course I find great concern when 94% of Israelis are supportive of Operation Cast Lead, which ends up killing 1,300 Palestinians. That indeed doesn’t seem like a people interested in peace. But we don’t always get what we want. If we wait for honest politicians, who say what they think, and think what they say, we may be waiting for a while. Maybe another 60 years of a while. And that’s something I’m not ready to do. So I’m willing to take a PM that chooses an entire cabinet of extremist buffoons, who’ll keep up the “save Israel” image quite well for Netanyahu, and if or when the time comes, the Peace bomb he’ll drop will be sweet enough to be picked by most Israelis (and likely rejected by most around him). This is what happened with Begin, and I hope will happen with Bibi. As for warm-peace vs. cold-peace, I prefer both to no-peace. Because no-peace isn’t just a phrase, it also has a very terrible meaning. It means that both sides (at least) can and do continue to battle one another. At times directly, at others, through proxies. And one never knows which of these “little battles” will turn uncontrollable, culminating in a horrific regional war that will kill tens of thousands, if not hundreds of thousands. So yes, I’ll take cold-peace to no-peace. Alex, I strongly disagree with you about which is easier to achieve – peace with Syria, or a comprehensive peace. Of course the latter is better. I’d love nothing more than to see a free and independent Palestine tomorrow morning, 61 years overdue. But when I look at what has to happen before this can become a reality, I see far more obstacles along the way to Palestine, than to the Golan. Most are on our side, but absolutely also on the Palestinians’ side, as well as on the side of a few other “interested parties”. If we keep hoping for a comprehensive peace, before taking the easiest step (which in any case will have to be taken to have peace with the Arab world), we’re setting ourselves up for another few decades of disappointment. Yossi, from Israel’s point of view, there will be no “cold peace” with Syria, just as there was no “cold peace” with Egypt initially. The spirit of optimism and hope will wash across every household here, if Syria and Israel sign a peace agreement. Thousands will flock to the Golan and to Damascus, to meet their ex-enemy. There is a thirst amongst many (probably 30% of Israelis), to end the Arab-Israeli conflict once and for all. They’ll see this as the second-to-last step to be taken. To us (in those 30%), it is clear the next step is Palestine. This was not the case in 1977 or 1979. Egypt was just a first-step, and the rest seemed so far away. But now, reality has completely changed. Israelis have heard that others in the Arab world are ready for peace. We’ve interacted with Palestinians long enough to know they’re ready for peace. So it’s mostly a problem on our side. And if a courageous Israeli leader find a way to “market” peace with Syria correctly, he’ll win over the hearts and minds of most Israelis (at least 60-70% I believe). There’s no doubt that we can’t assume Syrians will be “falling in love” with Israelis out of such “warmth” of Peace. It will not happen as long as the Palestinian people are suffering. You and I know this. But to make a decision that because of this fact, we’re going to gamble yet again on the Palestine-First program, and put Syria aside, would be a terrible mistake. Withdrawing from the Golan will prove to the entire Arab world that Israel is ready to consider the 1967 borders as our final borders. This is an extremely important signal to send, also to the Palestinians. Until we do so, everyone (correctly) assumes we’re not interested in peace. Unfortunately, Chris’s comments “propaganda” is the most accurate post on this thread thus far. Netanyahu’s situation is much different from Begin’s. The Sinai, the geography and Sadat are a bit different than the Golan, its geography and Assad. The issue, as it stands, is not just a sliver of land bordering the Lake. The issue is the whole peace treaty and what Assad is proposing. I’m still not sure what it is. What land is returned and for what peace. You guys talk like you know so perhaps you can outline for us the details. Frankly, there is no motivation for any party to this conflict to do anything other than enjoy the status quo. When you’re on an intoxicating power-ride that some in Israel seem to be on, then you’re right, why stop? 1) Yes. In which case, it certainly should get back its land. 2) No. It is continuing to fight Israel either directly or indirectly (via proxies, alliances, etc.) In which case, peace is what ends that. Syria would no longer fight Israel. What is so difficult to understand? What more do you need clarified? Why is it we could make peace with Egypt, which was a far more formidable enemy and exacted far heavier toll upon Israel than has Syria? Why isn’t Egypt continuing to fight Israel? Why isn’t Jordan? Why would Syria, if it got back the Golan? Paranoia isn’t very useful, even for AIPAC. It doesn’t get you very far, and the body-bags keep coming in (see Iraq since 2003). How many more Israeli body-bags are you willing to receive? Paranoia not useful? According to Haaretz the Israeli military is at present distributing a US financed booklet that details how the Vatican is training Hezbullah to kill Israelis. Given the above, a booklet on how Obama is selling out to the Arabs is said to be in preparation for publication just before November 2012. Paranoia indeed. Why doesn’t Syria also claim their lands in Turkey’s hands…but you do make problems to Israel?? ?Could someone explain? What “power ride” are you talking about? I’m just stating my opinion like you are. I prefer peace just like you Shai, however, like the Palestinians, I don’t sense the remaining neighbors (Syria and Lebanon) are motivated enough to actually sign a peace treaty. Sorry if my opinion rubs you the wrong way. Why is it we could make peace with Egypt, which was a far more formidable enemy and exacted far heavier toll upon Israel than has Syria? 1.) Sadat believed Israel was a legitimate nation. I don’t think Assad does. 2.) Sadat believed getting the Sinai back was important for Eygpt’s honor even in return for a real peace and better relations with the West. I don’t think Assad agrees with this. 3.) Sadat did not feel the need to calculate that peace would result in a vacuum whereby Eygptians would expect improvements back home. I think Assad has a lot of concerns about whether his rule could survive peace as Chris mentioned earlier. Why isn’t Egypt continuing to fight Israel? Why isn’t Jordan? Why would Syria, if it got back the Golan? I think a lot has do with Syria’s refusal to cut ties to terrorist organizations and Iran. When will you be joining the Palestinian resistance against the bloody AIPAC organization? Thanks for the Haaretz link. This is big news. Really? Isn’t Syria the one talking endlessly about peace as a strategic decision, and Israel endlessly finding excuses to reject it? Really? So why does he say “Peace with Israel”? According to you, he should be saying “Never peace with the Zionist entity”. But he doesn’t. Huh? Where have you heard Syria saying they don’t want better relations with the West? His concerns should be HIS, not yours or mine. If he didn’t think his rule could “survive peace”, why would he OFFER to make peace? Kind of odd, isn’t it? What has “a lot to do with it”? You have a record of omniscience when it comes to Syrian ties with Iran or Hezbollah? You KNOW that Syria will continue to support Israel’s enemies, even AFTER signing a peace treaty? Where do you get that from? And by the way, before Egypt signed a treaty with Israel, do you think it was particularly “peaceful” towards us? To remind you, it had fought in 5 different wars with us, not mere military operations, in just 25 years! Thousands of Israelis died in those wars, and many more were wounded. How many Israelis have died because of Syria? Because of Hezbollah? Because of Iran? Because of Hamas? Give me a ‘fricken break, will you. When the boogieman wears a beard and swears to Allah, you suddenly get all fearful. But when he kills ten times as many Jews, but has a nice English accent, you trust him! Our own Ehud Olmert, who would later try to return the West Bank and the Golan, voted AGAINST returning the Sinai to Egypt, even in return for peace! You know what, I accept your thesis. You’re suggesting that a precondition to peace, a demonstration of sincerity and readiness to abandon the way of the sword, is to dismantle one’s offensive capabilities (in Syria’s case, alliances with Iran, Hezbollah, and Hamas, as well its own programs and stockpiles of WMD’s). That does make sense, and I accept its rationale. But then, to be fair, wouldn’t Israel also have to first abandon its own offensive capabilities, in particular, its nuclear program? If Israel is demanding of Syria to dismantle its ability to threaten Israel, should Syria demand the same of Israel? Now you might claim that “Israel never threatened Syria…”, and that therefore the proof is on Syria. But then Syria could ask: “Well, who entered our sovereign airspace two years ago? And who assassinated a Hezbollah commander on our territory?” Who, in fact, has been more belligerent towards whom? Not to mention Syrian fears of Israeli action, given our record in Lebanon 2006 and Gaza 2008. So we must decide. If Israel can maintain its own offensive capabilities, its own strategic abilities to threaten any of our neighbors, it is only fair they should be able to retain theirs, even if it is in different form (i.e. not in form of nukes, but in form of alliances with Israel’s enemies). Now of course I’m not suggesting I’d accept peace with Syria if it would continue to allow Iranian weapons to pass through its territory to Hezbollah. And I don’t believe for a second Syria thinks it can retain this “support of the resistance”, also after regaining the Golan peacefully. But we cannot make unbalanced demands, such as to cut all relations with Iran, Hezbollah or Hamas, even political ones. Like Israel has allies and sponsors, so does Syria need hers. If we don’t use our sponsor’s (America’s) weaponry to attack Syria, there’s no reason Syria would do the same to us. After a peace treaty is signed, neither nation should have any interest in endangering the agreement. Your Post 45 seems to be in contradiction to Post 44. I think the whole agreement has to be conducted totally, with all the i’s and t’s dotted and crossed before it goes public. Furthermore, it will have to agreed to simultaneously. No side will agree to peace BEFORE land is ceded and no side will reliquish land BEFORE peace is promised. All in writing, with every “baby-step” enforceable, and signed-off by the UN and the Quartet, including a procedure for addressing non-compliance. To the dismay of the Syrians, Israel can not afford another Oslo. The two comments do not contradict. I was trying to show you the absurdity in some of Israel’s demands (preconditions) of Syria, which if demanded of us, would never be accepted. As for the rest of your comment, I actually agree. But remember that the failure of Oslo was no less bad for the Palestinians than it was for Israelis. In fact, it was FAR WORSE for them, than for us. As much as we’ve been brainwashed to believe, in Israel and in the U.S., that Israel is the weaker side, the threatened one, the fragile nation that could become extinct so easily, you and I know this is simply not true. From sometime in the mid to late 1960’s, after Israel achieved nuclear capability, our existence was no longer in question. No nation could destroy us. But this isn’t told to Israelis, because it renders fear and paranoia unnecessary, and irrelevant. And if Israelis (and their supporters in the U.S.) no longer need to fear, no longer need to sense an existential-threat, then how could we justify continued defense budgets in the billions? How could we justify taking money away from Education and Welfare, and pouring it into the pockets of Defense contractors? How could we justify continued settlement activity, and ongoing Occupation of another people’s land? I have no doubt that one day our children will teach in schools that “true reality” was manipulated, and often hidden, from the average citizen. That suspicion, hatred, and demonization replaced truth, and openness, and compassion. That force and cowardice replaced hope and courage. Akbar, and when this will come out and be written in our history books, I hope you’ll be able to tell yourself (and your grandchildren) that you were on the right side of the equation. That you didn’t lend a hand to this. That you neither fooled others, nor were fooled yourself. That you were open and courageous enough to change. Because I believe that you DO want peace, I’d still like to believe that you CAN change. You don’t need to become a “liberal leftist” to see and understand reality differently. There has, and will always be a need for conservative-minded people. We keep each other at check. But we must also both contribute to a better and safer future for our children. And we cannot do so while perpetuating the state of war, while exercising stubbornness, or while remaining blind to changes around us. Like Alon Liel once told me, while he was a young cadet at the Foreign Ministry Course (this was before peace with Egypt), they used to hear a certain mantra repeated every single week. And it went something like “If ANY Arab nation is ready to talk to Israel, we must JUMP at it.” In those days, Israelis were less cynical, less self-confident, less belligerent. Then, a peaceful future with our neighbors, and in our region, truly WAS more important than hanging on to pieces of conquered land. Hope was real, and Israel was ready to do its share to bring about peace. Today we live in a different Israel. And we must fight to change this around. We must become a truly peaceful nation. And we must come to recognize that it is not only THEY (the Arabs) that must learn to accept us, but it is also US that must learn to accept them. Reading Imad’s comment, I didn’t find any mention whatsoever of turning anything else than a very small area into a nature park under international supervision. In Imad’s own words, and I quote, he says: “that the dispute revolves around a few hundred square meters bordering what is known as the Sea of Galilee, in Syria it is known as Lake Tiberius”. Why is it being presented as covering the whole plateau? As for shameful xenophobic comments in the column, your readers should know better. Land for peace seems to be both a prerequisite and a deal breaker for negotiations with Israel. While the land may be considered holy, the same can not be said for those who stubbornly insist that it can not be shared between various parties. How much time, blood and treasure has to be wasted for some mildewed mantra that calls for competing capitals to control completely or not at all? Does this mean that one side or another must prevail over the other side for the land to host people living in peace? People who have learned only to try to carve a bigger slice of the same pie need to be shown that while there is no more land being made, the life of the people on top of it can expand in ways more productive than currently possible. True leaders would teach their people a path to a greater future. This desire to reclaim the Golan Heights is petty for the fact that it is not possible without assurances of security made to Israel. Absolute sovereignty by Syria over this land can not occur while Israel fears that Syria covets its land and supports its destruction. Everyone who is serious about this issue understands this. Why not build a park there and charge admission? It is a better deal than you are going to get waiting for victory over your sworn enemy. As for this CAMERA.org report you gave here, I think you’re right. When we employ rational thinking to the matter, it certainly makes more sense that a few anonymous reserve soldiers who have come out of Gaza are lying through their teeth, than the many not-anonymous soldiers who are standing behind the IDF’s action in Operation Cast Lead. After all, if crimes were committed, wouldn’t the majority speak about them? So what if that same majority may have participated in those crimes? Most people are honest, and would gladly inform the world of crimes they may have committed in Gaza. Those anonymous few “yefe nefesh” soldiers, are obviously self-hating Jews (a term Bibi is apparently now attributing to Rahm Emanuel and David Axlerod), who have nothing better to do than lie about their country. Once again CAMERA.org has proven its case. Quod erat demonstrandum. Do the good guys at camera.org ever tolerate ANY criticism of Israel? … no. Does that makes them a 100% propaganda tool? .. yes. Do you have any problem with that? no. Does this make you a robot that can not learn? .. yes. Of course I do expect politicians to lie. But when it comes to international agreements (signed or verbal) there is very little room for tolerating such things. Even when some army general in some African country takes over after killing his predecessor, the first thing he usually does is to state that he will respect all international agreements. Israel feels powerful enough to not give a damn about ANY of the UN resolutions issued against her … Israeli governments can flip previous government’s obligations with ease … The way the “Rabin deposit” was ignored after his assassination is not forgotten by Syria. What I am trying to say is that the Arabs do not think the settlements are continuously expanding simply because of corrupt Israeli politicians .. they are expanding because it is a strategy of the state of Israel… no matter who governs. >>> How much time, blood and treasure has to be wasted for some mildewed mantra that calls for competing capitals to control completely or not at all? Does this mean that one side or another must prevail over the other side for the land to host people living in peace? Ah, likely, yes. That’s the likely requirement for long-term peace. There is no long-term historic precedent in the region to counter this assumption. Since I’d like to believe Israel is some-sort of a Democracy, I certainly blame my people for the Occupation no less than our politicians (in fact, even more, because it is still us that elect them, not the other way around). So yes, Israeli society has certainly supported Settlements throughout the past 40 years, and with every single government in power. But like so many other contradictions in our region, I believe most Israelis at the same time want peace. How can that be? Well, Rabin, Peres, even Sharon and Olmert, were all elected specifically to withdraw from the same territories they encouraged settlements in. Had Sharon not fallen ill, perhaps by now you and I would not be talking about continued Settlement-building. And I think that by now, most Israelis know that the West Bank is going to be a part of Palestine, and that Greater Israel will remain a myth. The question is not if, but when and how. What the Obama administration is apparently beginning to do, is to reject our endless excuses. Let’s see where that takes us. It is not a question of “tolerating…criticism” or not. CAMERA’s purpose is to counter the TONNES of criticism from the worlds media and the respective governments. That’s their job. I hope it is not a surprise to you Alex, but the Arabs have many similar organizations like the Arab-American Institute, the ADC, CAIR, ARAMCO and the 20+ Arab governments. They do the same thing as CAMERA. And your website isn’t a pro-Syrian “propaganda tool” Alex? Every side of the conflict has a right to explain their narrative. It is up to the objective observer to side with one side or the other, none or both. I was going to ask you the same question now that you ask. I responded to this yesterday. Any idea where the post went? Your comment was stuck in the spam filter because it had many links. I just released it. As for the difference between you and I … you always buy the version that you read in your Israeli propaganda sources (like camera.org) … when was the last time I linked an article from Syrian newspapers? You are welcome to link WSJ pro Israel opinion pieces, there are plenty … but please spare us camera.org propaganda and we will continue to spare you CAIR and ADC propaganda. And do you need me to remind you that many times Joshua and I posted news critical of Syria? … remember the many Ehsani pieces critical of economic policies? … the many news stories about Syrian political prisoners? When was the last time YOU posted anything critical of Israel? YOU are a robot Akbar, I am not. so there is a price tag? who would have thought… and from such peace loving nation? bless..
All these threads are FILLED with articles that you or Professor Josh, etc link to. And 95% of them are critical of Israel. You and I are no different. I’m a pro-Israel supporter and you’re a pro-Syria supporter. Face it. The only difference is that I cannot post or link articles. That is only left for the “authors” such as yourself and Professor Josh. I addressed this issue (pet peeve) on another recent thread. This is “Syria” Comment … yet the majority of comments are by Israelis … and 99%+ of comments by Israelis like you who are “pro Israel” (including Shai and Yossi who are much more pro Israel that the hawks like you, if you ask me) are allowed unmoderated. Can you tell me if I am a robot who is engaged in Pro-Syria propaganda, why would I allow “pro Israel” commentators to be all over the place here? You know that the articles that Joshua posts are usually followed by a much longer comment section … here is comment number 63 for example. This blog’s comments section is often more popular that the original posts because Joshua does not try to make it his personal promotion blog like most other blogs. So you have been welcome to participate as much as you want in this “Syria” blog… by Syria propagandists? I assure you that if Syria ever matched Israel in its unnecessary violence, I will be as vocal in criticizing Syria as I am in criticizing Israel. And I assure you that if Syria displayed the same hesitation to reaching a comprehensive peace that Israel has, I will criticize Syria. Until then, I will only criticize Syrian corruption and treatment of some of the decent political prisoners… the two most known names (Michel Kilo and Aref Dalile) were released this year. Syria’s wise regional policies are perhaps the reason why the region did not totally collapse after the Iraq war … there is nothing to criticize there. I totally support Alex in his comment above. I’ve seen many hundreds, perhaps more than a thousand blogs in the past decade, and none are like Syria Comment. It is not only the level of the commentators, and the discussions that take place here each and every day, but indeed the fact that we have been welcomed here by none other than… our “enemy”. Believe me, if 50.1% of Israelis knew SC, there would be peace tomorrow morning. These are “propagandists”? Joshua and Alex have allowed every kind of Israeli and Israel-supporter to voice their opinion, sometimes 10 and 20 times a day. Alex pointed out a few days ago that you never seem to exhibit even the slightest criticism towards Israel, and that your message is always the same. In that sense, you are an AIPAC-like “robot”. Programmed to support Israel no matter what, and always running the same script. And STILL the moderators allow you to voice your mantras. A real propagandist would neither allow opposing voices to be heard, nor anything deemed counter-propaganda. Personally, I do take issue with the occasional impolite mannerism practiced by a few Israelis and Israel-supporters in this forum. If there’s something we most definitely lack, and can certainly learn much from the Arabs, it is politeness and hospitality. It would be great if Israeli liberals were as polite and hospitable to Israelis as they are to Arab supporters of terrorist organizations. Plus, I think there is a lot the Arabs can learn from Israelis. Do you agree Shai? And please, don’t bore me about “robots” and my “one-tracked” support for Israel, and my “propaganda”. I am a mirror image of Professor Josh, Alex, and the tonnes of pro-Syrian articles they post “sometimes 10 and 20 times a day”. I know the “robot” thing bores you. Maybe there’s a reason it bores you. No, I don’t think Arabs can learn anything from Jews – that’s the answer you wanted to hear, no? Of course I think Arabs can learn from us, and we can learn much from them. It’s easier to do, if we truly view one another as equals, though. It’s more difficult, when one side feels and acts superior to the other. Do you really think I’m being impolite or inhospitable to Israelis? I don’t think so. By the way, since you’ve convinced yourself that I just love supporters of terrorism, how would you explain that? Try to explain this without using Neocon phraseology such as “self-hating”, etc.